This week atmospheric Co2 passed 410ppm, the highest level for three million years. We are heading for a climate totally unfit for human civilization, a climate unseen for 50 million years, and we could get to this ghastly outcome within the lifetime of children alive today. Climate change is just one aspect of a wider Ecological Crisis that includes habitat loss, species extinction, ocean acidification, desertification and myriad forms of pollution. In the UK we also face a Social Crisis that has at its heart rising inequality and chronic underfunding of health, education, housing and other public services. Since my adolescence in the late 1960’s and early 1970’s I’ve been an environmentalist, and like most environmentalists then and now, also committed to social justice based on much greater equality. In those early days the only way of causing less polluting lives was to live simpler lives. We drew inspiration from Gandhi, Ivan Illich, Fritz Schumacher and then young Jonathon Porritt. An ecologically sustainable lifestyle inevitably meant using less energy. There were some futuristic writers, like Buckminster Fuller, who had visions of the future based on higher tech, but any truly sustainable source of energy supply was off in some distant future. Over the last half a century there has been a cleantech revolution. Now we have the technology to provide a Swedish standard of living to all 7.5 billion of us humans. As I keep saying on this blog, technologically so much is possible. If we applied the principles of ecological sustainability and social justice systematically humanity could very quickly banish much of both the Ecological Crisis and the Social Crisis to history. We could create a carbon negative global economy with zero hunger and poverty. To achieve this we need different politicians. Why Sweden is rich and Somalia is poor has more to do with politics, history and culture than due to resources or possibilities. Why we in UK are living through a protracted period of austerity and Sweden is not is due to the different political decisions that have been made. While Sweden systematically applies goals of ecological sustainability and social justice the UK does not. We in this country currently have a government focused on further enriching a tiny clique of billionaires, and are prepared to trash the climate and the lives of our own people in order achieve this insane goal. We have a UK general election on 8th June, and local elections on 4th May. 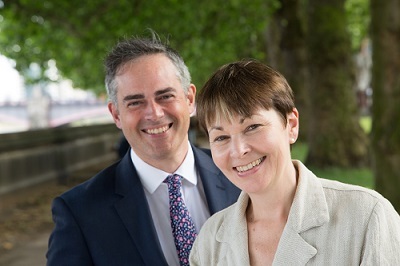 Please register to vote, and please vote, ideally for the Green Party, but failing that for any politician you feel can contribute to getting rid of Theresa May and this awful government. The UK desperately needs a government that understands the Ecological Crisis and the Social Crisis and is prepared to radically redistribute resources to achieve the twin goals of Ecological Sustainability and Social Justice. This entry was posted in Climate Change, Environmental, Politics on 24 April 2017 by Richard. This week Scotrenewables announced the successful operation of their SR2000 floating tidal energy device, operating at full 2MW capacity. The SR2000 weighs 500 tonnes, has a floating main body with two 1MW turbines that fold up while in transit and fold down while in use. Because they can be easily built and deployed without expensive specialist support vessels the overall costs should be kept down. This is the largest tidal stream energy device currently operating anywhere in the World. The initial site is in Lashy Sound between Eday and Sanday in the Orkneys where there are very strong tidal currents, but Scotrenewables claim the same technology can be easily adapted to areas with slower tidal currents or used in rivers, so opening up many diverse potential markets. Scotrenewables are based in Kirkwall and have worked closely with the European Marine Energy Centre (EMEC) in Stromness. I’ve blogged before about tidal energy and EMEC in 2010 and 2013. MeyGen with their seabed mounted tidal stream turbines still seem to be progressing with their project in the Pentland Firth. The Hendry Review into tidal lagoon technology came out strongly in favour a few months back, and work on the Swansea Bay Tidal Lagoon project is due to start in 2018. Perhaps at long last the tide is turning in favour of tidal energy. These three pioneering tidal energy companies offer great possibilities for helping meet UK energy needs and also represent a huge potential for exporting the technology globally. At least two of the three companies have been helped by EMEC, and EMEC continue to work with other pioneering and innovative wave and tidal start-up companies. It is tragic to think that if Brexit does indeed go ahead the UK may lose many global centres of excellence such as EMEC that have come to the UK only because our membership of the EU and depend on EU funding and collaboration. This entry was posted in Energy on 17 April 2017 by Richard. The move away from petrol, and more especially diesel cars, buses and trucks is gathering pace. Greenpeace and the Guardian have shown how hundreds of thousands of children are routinely exposed to illegal levels of air pollution. Sadiq Khan is bringing in the Ultra Low Emission Zone. Courts in Munich and Stuttgart have instructed city authorities to prepare to ban diesel cars and plan the transition to electric. Many cities around the world are now striving to clean up their air quality, and since the dieselgate scandal the image of the diesel car has been in freefall. The petrol engine too is on its way out. Stock markets sense the direction of travel. Last week the stock market valuation of Tesla overtook both Ford and General Motors, despite Tesla still having never made a profit and only producing a tiny fraction of the number of vehicles than their more established rivals. As the population of many big cities is growing and space is very much at a premium there is a very strong argument to limit private car use within cities, even for zero emission vehicles: there simply is not the space for them. 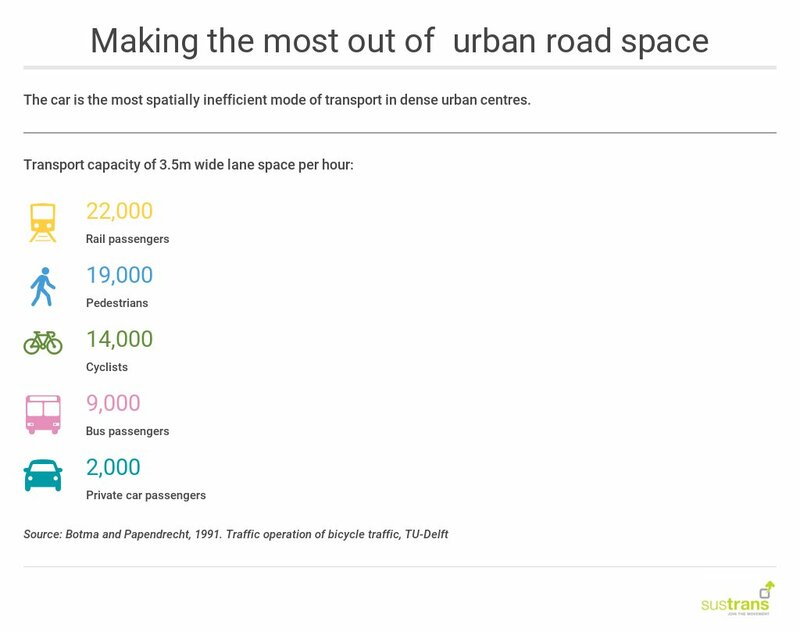 By improving public transport, walking and cycling facilities it is possible to move very much larger numbers of people more quickly around the limited available space, as the above table shows. A few weeks ago the giant Chinese company Geely opened a new car factory in Coventry. It is now making the new TX5 London taxi, a plug-in hybrid with a 70 mile battery range and a petrol back-up motor. The TX5 is a six seater with space for a wheelchair. This looks to be a considerable improvement on the old dirty diesel taxis currently in use. In the longer term the TX5 hybrid is likely to be superceded by an all electric or hydrogen fuel cell vehicle. The best cities around the world are continually improving walking, cycling and zero emissions public transport systems. More streets are being pedestrianized. The next logical steps are to roll-out zero emission taxis, ban diesel and petrol cars and allow some, but probably quite restricted, use of zero emission private cars. Such cities should be a joy to live in: safer, quieter and cleaner, and with air fit to breathe. This entry was posted in Environmental, Transport on 11 April 2017 by Richard.